Good evening everyone! I wanted to share a couple of more resources I have used when teaching kids about Handling Change!. You may have seen a recent post with a PowerPoint lesson for kids I shared called, “A Kid’s Guide to Understanding and Handling Change.” In these new resources, I use the fabulous 5 Point Scale (Kari Dunn-Buron & Mitzi Curtis – http://www.5pointscale.com/). The 5 Point Scale is a wonderful tool I incorporated to this topic to help kids understand what “SIZE” of a change they might be facing. This tool helps kids “quantify” and compartmentalize what might constitute a small change versus a bigger, life-altering change. Remember, many kids with social/emotional challenges have difficulty seeing the “grays”, and the exceptions to the rule. They are “all-or-none” folks. These kids perceive situations and feelings as exaggerated and “huge or intense” much of the time. Many times they need a concrete, visual tool that breaks down information in a way that they can process. 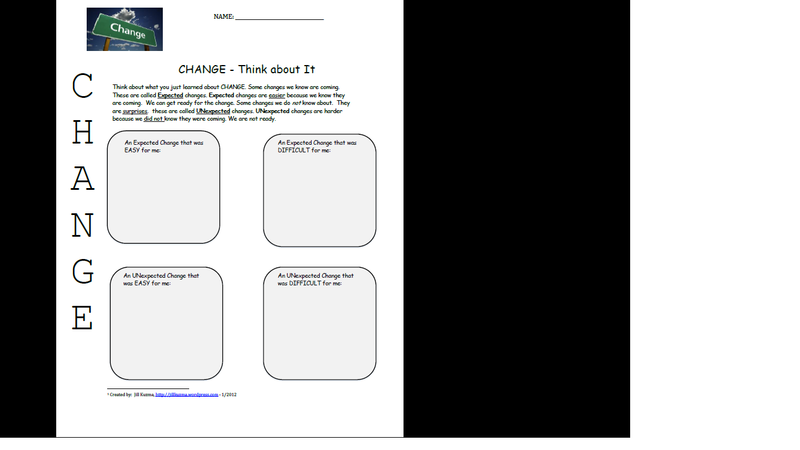 1) A worksheet to help kids think about what “Expected” Changes they encounter, versus “Unexpected Changes”. 2) A two-page document using the 5 Point Scale. The first page has a graph of the 5 Point Scale and some operational definitions of each SIZE of change, with some examples. There is a section for kids to record some of their own personal examples for each size. The second page is a page with just the definitions. Now, keep in mind that I have kind of systematically tried to “define” each type of change. Of course, these definitions are not written in stone, nor are they the Gospel. But, I wanted to provide something concrete for my students to wrap their heads around. 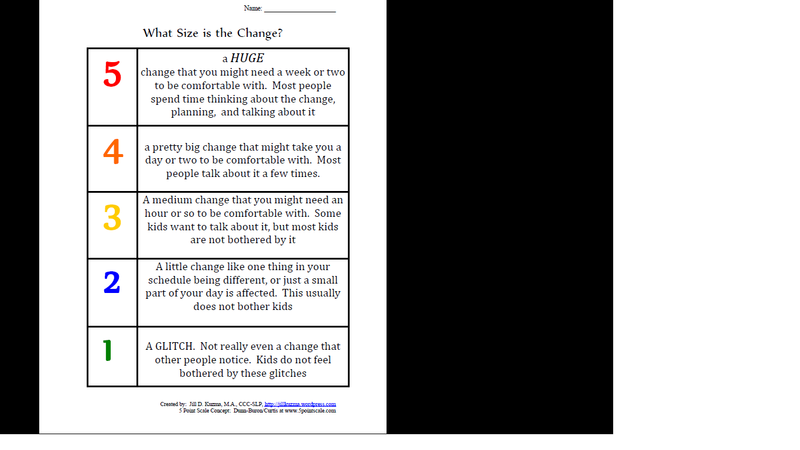 When CHANGES occur in your classroom, or even for book characters, read aloud characters, etc – stop and take a moment to review the 5 Point Scale provided here and ask your students, “What size change is this?” “Was this an expected or unexpected change?”, “Do you think this change is welcome or unwelcome?”. Using this visual and asking these questions during langauge arts work and read aloud time can help to transfer some of the social/emotional learning points into other aspects of the child’s school day.